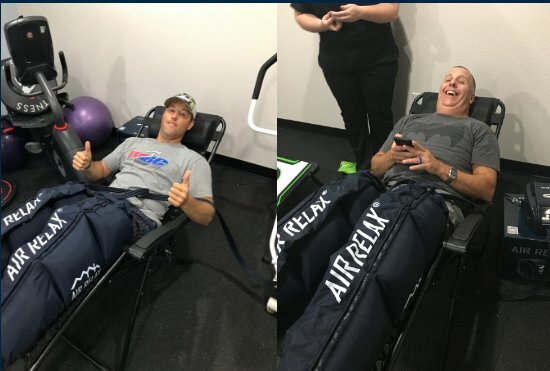 Air-Relax uses the most advanced digitally controlled air pressure system to provide dynamic compression to limbs compromised by poor circulation and fatigue. Recovery pumps and compression sleeves are used by sports teams, universities, physical therapists and professional athletes all over the world to treat their injuries, enhance their training and ultimately feel better. How does it feel? How long does it last? Compression sleeves will inflate in patterns and pressures specifically desired by the patient. The sleeves are divided into multiple chambers encompasing the whole leg. Each chamber will fill up with air and then release after a few seconds. Each session is up to 30 minutes. We have provided an anti-gravity recliner that allows you to sit back and relax and feel as if you are getting a leg and foot massage.